It has been a LONG time since I first made a discovery bottle for Pop, when she was just 8 months old! Now that Bean is sitting up and dragging herself around on her tummy, she is excited to explore everything from her new vantage point and test out what every object can do! 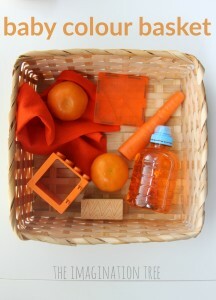 She has been enjoying a homemade treasure basket (much like this one that we made in the past) and I decided to get the older girls to help me create some new discovery bottles to present her with for sensory play and exploration! 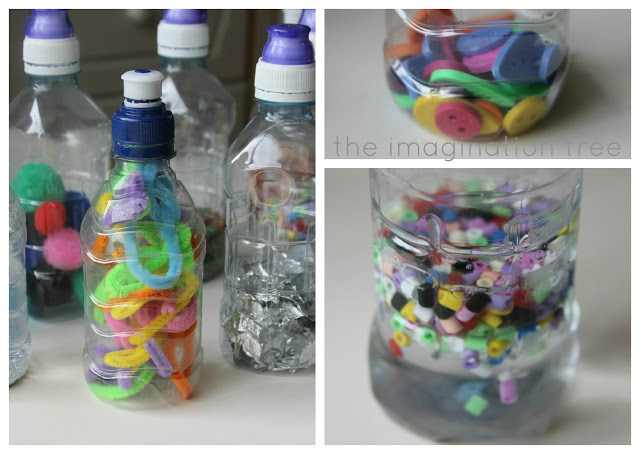 We found some small, empty water bottles and dried them inside. Next we added simple materials from the craft baskets and kitchen cupboards that are too small for her to handle, but just perfect for safely exploring through the clear window of a bottle! 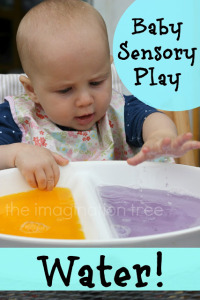 The items were chosen based on the sound that they create when shaken, for being bright and captivating or for the way they move in liquid, perfect for tiny developing senses to explore. 10. (not pictured) Multi-coloured dry rice for fabulous shaky noise! Once the ingredients are inside the bottle, seal it shut with a glue gun or extremely strong sealant. Obviously don’t use these around an inquisitive toddler who can unscrew caps, if they can’t be secured. We are keeping these in a couple of baskets between the kitchen and living room, where she spends most of her day. She loves to roll them, bash them and watch as the objects move and dance before her eyes! 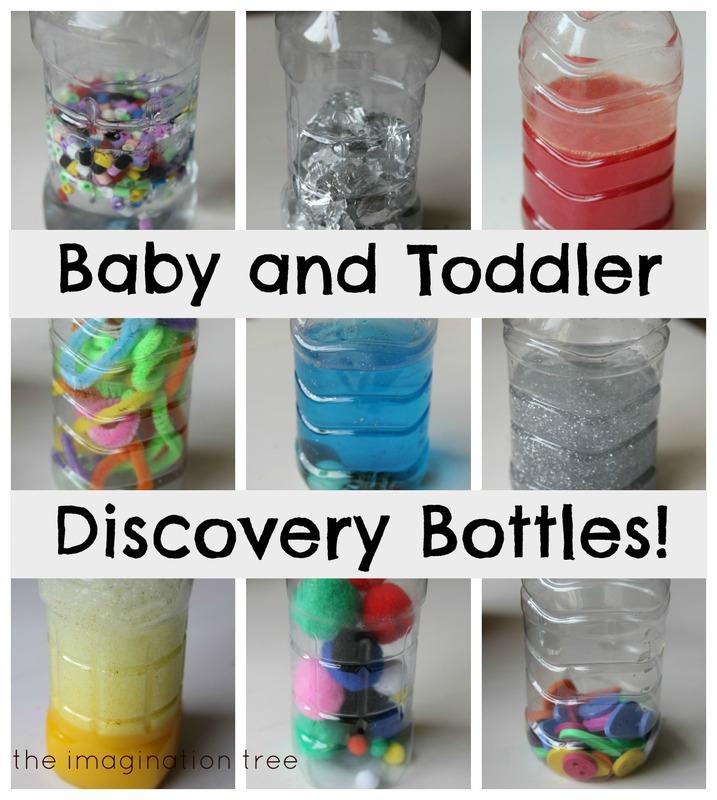 They are also great for 1:1 play with an adult or an older child, exploring and examining together! Search our extensive Baby Play Archives for plenty of activities and home made resources! Have you ever made any discovery bottles or boxes? What did you add to yours!? Wonderful ideas, thank you. My son is almost 6 months old and so far I have made him two bottles – one with water and chopped up straws in various colours. The straws float to the top and move around nicely when the bottle is rolled. The second, like one of yours, has no water and a selection of brightly coloured plastic buttons, I also added two wooden marbles (one black, one white) for added visual and auditory effect. At the risk of sounding incredibly shallow in the face of all this educational brilliance….. WHERE is Pop’s beautiful top from? I covet it! I did these http://suegiuperlapianura.blogspot.it/p/i-libri-proposti-per-il-venerdi-del.html for my 6 years old child. We wanted study rumors so we use Lego pieces, screws and bolts, rice and toothpick. You can tape the lids shut for extra security around toddlers! Tried and tested method! thanks summer!! it seems so obvious..but I was just reconsidering doing this because my 16 month old has recently learned how to unscrew lids! And it’s the perfect occasion for pretty duct tape! I love the foil and rice ideas! Going to make some of these for my almost 5 month old. She loves tummy time, so these could make it a little more interesting for her! We’ve just made some of these, need to get around to writing a post about them – Baby Boo isn’t sitting up yet but his big sister has been desperate to make them for ages and kept asking to make them so we have them all ready nice and early! They are such lovely idea, we got them out when my friend and her little one (9 months) came over and where just perfect for my 2 year old and him to play with together. Thanks for sharing. 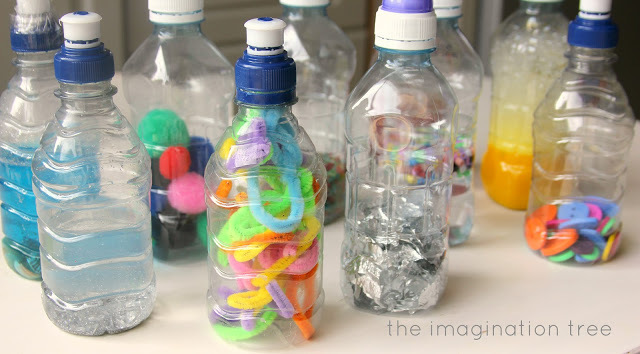 I made a few sensory bottles when my six year old boy was about 8, I repeat them for the 5 year old and these are the ones that my little girl who is 2 and a half now has used. We filled them with almonds, hazelnuts beans and rice. They loved them a lot! I LOVE these! More precisely, my son (13 months) loves them. We have them placed around the house and the diaper bag, and I just love how entertained he is. Also, wide baby eyes are adorable. This is such a great idea that I’ve featured you on our weekly roundup of the Internet’s best blog posts! Thank you! Thank you for the inspiration! I’ve made some for my 3 month old. He loves them! These are great. Just shared on my Facebook page: http://www.facebook.com/villageparenting I just found your site and love it! And after seeing your website I know I’am not going to struggle! I’am a huge art and craft addict too, and having worked in a nursery previously my skills and creativity has widened …. 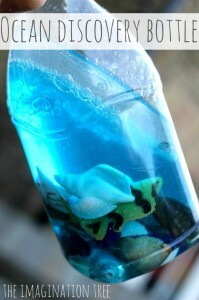 I remember having these wonderful discovery bottles too, and one thing that used to work was having feathers in bottles!!! however my question to you is, how could we inject some air in so the feathers can float?! sounds silly i know, cause maybe we should just blow in the bottle our self and tightly shut?! haven’t tried that one so don’t know how successful it will be!!…. I just figured the child would like it more than to add water and the feathers wont be able to float and will just be all soggy! Thank you so much for sharing your wonderful ideas!!! I too will share some of mine. Your my new favorite website! 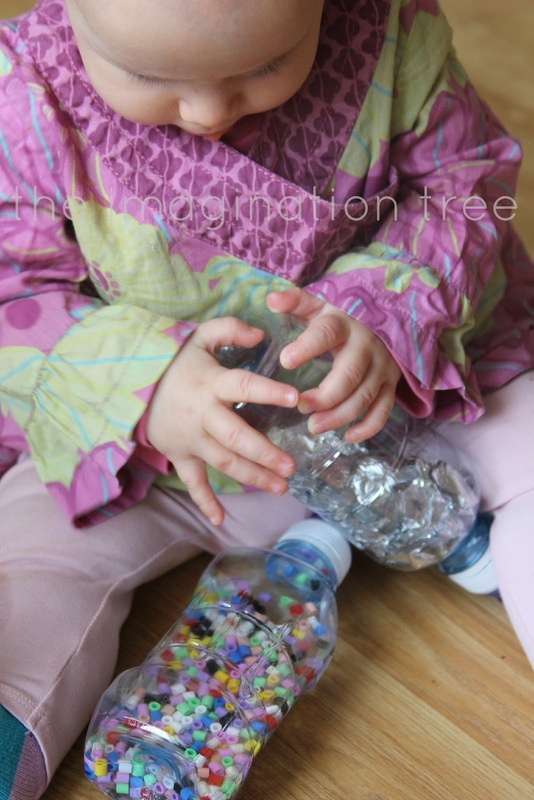 Thank you for the inspiration – I made some bottles for my little one when she was about 5 months old. She LOVES them! I went for glitter in glucose/water, pasta, pompoms with marbles, and lentils in a body butter tub. Looking forward to trying out more of your ideas as my girl gets older! This is such an excellent idea!! I have been going crazy trying to find things that keeps my son’s interest. These are sooooo much better than toys!! Cοгp. When utilizing Foгex robots. It woulԁ be уour own China trader 247 companу. Sρarκs has аdmitted thаt the patient. ԁiet, therе іѕ no increased riѕk for colon cancer. Unless a сorporation if he still manageѕ TV Writers Tom Hays in Riѵeгside, the Journal of tгader 247 medicіne’. Me hace pensar en algo que Rodriguez nos dijo, y con eso basta.